When I speak at schools children often know Woody Guthrie wrote "This Land Is Your Land," but when I ask what else he wrote, the answer is silence. Yet Woody also composed journals, letters, essays, poems, newspaper columns, radio shows, and more than one thousand songs. This biography introduces young readers to the fascinating life of the unique man who wrote such songs as "Oklahoma Hills" and "Roll on Columbia," songs that illuminate the spirit of Woody Guthrie, songs that illuminate the spirit of America. "…a solid addition to the growing body of resources documenting the life of the musician and the important events of 20th-century American history that shaped his colorful life and work." "…yet another excellent biography…this scholarly work packs a lot into its pages…Coombs does an excellent job of relating Guthrie' life story and neither glosses over nor sensationalizes…." 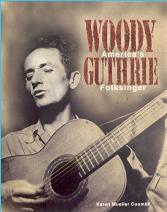 "Often intriguing, the life of Woody Guthrie is creatively shared through vignettes, photographs, and quotes in this detailed biography…The reader is sympathetically drawn into his life and into the time period in which he lived…This book is written for children, but will be enjoyed equally by adults…. " "Compelling reading…this biography offers a fascinating glimpse of a folk music legend…"
A crowd of more than one thousand filled Phythian Hall in New York on March 17, 1956. The people had come to honor Woody Guthrie, one of the nation's most famous folksingers and songwriters. Onstage, Woody's old friends and companions read his words and sang his songs--songs such as "So Long, It's Been Good to Know Yuh," "Roll On, Columbia," and "This Train Is Bound for Glory." For a brief two decades, Woody Guthrie wrote and sang of his feelings about the United States. In that short time span, he also composed journals, letters, essays, poems, newspaper columns, radio shows, and more than one thousand songs: love songs, work songs, hobo songs, outlaw ballads. He wrote about disasters, the simple joys of childhood, the workingman's struggle, the black man's misery, the fight against Adolf Hitler, and the beauty he saw around him. Mainly, he wrote songs of hope, because Woody Guthrie believed that, given the right song, downtrodden and discouraged people everywhere could rise up singing. The Pythian Hall concert closed with the entire cast singing "This Land Is Your Land." Suddenly, the spotlight swung to the darkened balcony. It shone on a spidery, bushy-haired man, who struggled awkwardly to rise, then raised a clenched fist to greet the audience. Recognizing Woody, the crowd surged to its feet, cheering. The song ended. Woody's friend and fellow folksinger, Pete Seeger--tears streaming down his cheeks--began the first verse again. The audience joined in, filling the hall with Woody's most famous song, telling him they would carry his music across the land and into the future. Jackie Robinson once wrote, "A life is not important except in the impact it has on other lives." This book, suitable for upper elementary students and beyond, tells of the struggle Robinson underwent as the first African-American to play modern major league baseball in the United States. In breaking this barrier, Robinson affected the lives of all Americans. Jackie Robinson, Baseball's Civil Rights Legend focuses more on Robinson's overlooked trailblazing for civil rights than on his baseball career. "…so elegiac it almost moved me to tears. And I ain't a crying' man." 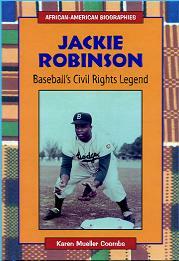 "His involvement in business and politics and his staunch advocacy of the right of African Americans receive lively treatment in this important biography"
"This concise and accessible biography details with great humanity the events and personal strengths that made Jackie Robinson's life so inspiring." Jackie Robinson once wrote, "A life is not important except in the impact it has on other lives. "Robinson's life affected the lives of all Americans. That made his life very important indeed. Ed Charles, former third baseman for the New York Mets, recalled a Dodgers' visit to his Florida hometown. After watching the rookie Robinson play a spring exhibition game, all the children ran after the train carrying the team. When they could run no farther, they put their ears to the tracks, listening as the train carried their hero toward his future. "We wanted to be part of him as long as we could," said Charles. Part of every young person belongs to Jackie Robinson. It is the part where secret dreams are stored. Jackie Robinson showed America's children, especially its African-American children, that these dreams do come true. In doing so, every child became a part of him forever--and he became a part of us all. 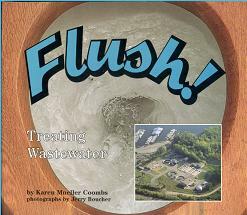 "A thorough and lively explanation of how wastewater is treated in the U.S….Clear explanations…make the process easy and interesting to follow." "The photographs are plentiful, high quality and surprisingly attractive given the subject matter. Coupled with the appealing jacket and high-interest topic, they help make this a good purchase for both public and school library collections." "…a nice balance between the things kids ought to know about wastewater and the things they want to know….her tone is lively and far from dry, but it fortunately avoids the yuckety-yuck goofiness of other works on the subject." The untreated water, called influent, flows into a large concrete channel. The bar screen stands in the middle of this channel. As the brownish green wastewater passes through, the screen catches any large solid objects floating in the sewage. This includes human waste, wads of toilet paper, disposable diapers, plastics, rags, small toys, false teeth, jewelry, sometimes even paper money. If the water comes from a combined sewer, the screen also catches sticks or rubber balls that have fallen down the sewer. Some bar screens have caught dead--and sometimes live--turtles, eels, and snakes. In the 1930s, rains stopped, winds howled, and fields turned to dust. During the Dust Bowl era, many North Americans lost their homes, jobs, and hopes for the future. This book looks at the lives of children as they faced drought, hunger, and the challenges of finding new homes. 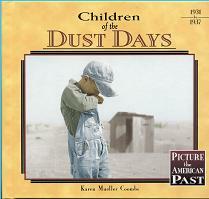 Children of the Dust Days, illustrated with photos from the past, is seen through the eyes of the children who lived it. It is part of the series, "Picture the American Past." The book includes a class project, glossary, timeline, notes for teachers, and additional resources. "With spare text and photos on every page, Coombs brings the dust and drought of the 1930s to life….An exceptional introduction to this era in North American history." "A concise and informative overview." "…an excellent study about children in the 1930s era." And a black old dust storm filled the sky . . .
--words to "Talking Dust Bowl,"
No rain! Year after year, no rain! Ponds dried up. Soil cracked. Drought gripped the plains of North America. Between 1931 and 1937, the dry land spread from Texas to the prairies of Canada. Life there became hard for children and their parents. When a bit of rain fell, crops sprouted. Then grasshoppers came. They munched the new plants down to the ground. Sometimes the 'hoppers even ate the wash drying on the line. With no rain, few seeds sprouted. No roots grew to hold the earth in place. Wind lifted the soil from the dry, plowed fields. The wind flung the soil across the land. Billowing dust clouds looked like black blizzards. The soil sometimes blew all the way to the Atlantic Ocean. It drifted down on ships at sea.